With all proper apologies and deference to Jaywalker, and despite my parents having thoroughly enjoyed their trip there last year – there are an entire host of countries on my To Visit list that excite my culture vulture more than Belgium. However, this is not to say that you should not visit Belgium or northern France if you ever have the opportunity. In particular, I urge you to take your children. I had wanted for a number of years to make the journey – a pilgrimage of sorts – to Belgium. 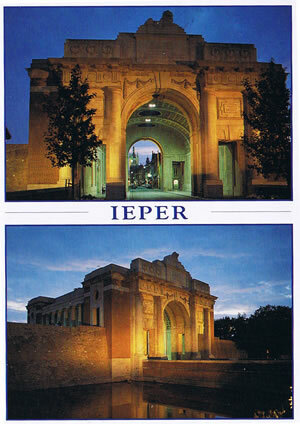 Ieper, to be precise. Somehow I just never managed to get near the place. Eventually in 2004 I managed to kill four birds with one stone (thus slightly muting Hubby’s parsimonious squeaks); we decided to get the ferry over to Calais in order to buy the wine for our wedding reception. We I scheduled the trip for Valentines Day (romantic visit to Continent: check) and as my birthday falls the day afterwards (romantic birthday trip to Continent: check) I was able to talk Hubby into an overnight stay in the next country along, in order to visit Ieper (romantic birthday visit to the Continental War Graves: check). I did not precisely distinguish myself driving through the last section of France – I turned off the autoroute onto a local road and promptly forgot about that whole pesky driving on the right thing. I have seen real fear in a number of faces during my life, and those in the cars driving straight towards us that day contributed significantly towards my overall total. In the midst of my horror I had a panicky idea about national police jurisdictions and therefore floored the accelerator for a few miles until we crossed the border into Belgium, before ceding the driving seat to a white-faced hubby. We then proceeded to the Ieper (Ypres) Novotel with extreme caution and ridiculously exaggerated courtesy to other roadusers. That night, I stood silently at the Menin Gate at 8pm, and my tears and the heavy rain both poured as the bugler sounded the Last Post. With the sole exception of the 1940 – 1944 German occupation (when the ceremony continued at Brookwood Military Cemetery, Surrey) it has sounded every night and in all weathers since 1929, commemorating those who died. Every last one of them a mother’s child. We will take Harry there when he is old enough to begin to understand that they shall grow not old. We will revisit the Flanders Fields Museum and the Passchendaele War Cemetery. We will explain to him why we fall silent on the eleventh hour of the eleventh day of the eleventh month. We will tell him why we wear poppies in early November, and I hope he will wear one himself with pride. Sadly, it is likely that the last three surviving UK-resident British veterans of World War One will not live long enough to be present at a Cenotaph service that Harry would be old enough to remember into adulthood. 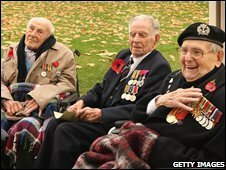 Henry Allingham, 112, Harry Patch, 110, and Bill Stone, 108.